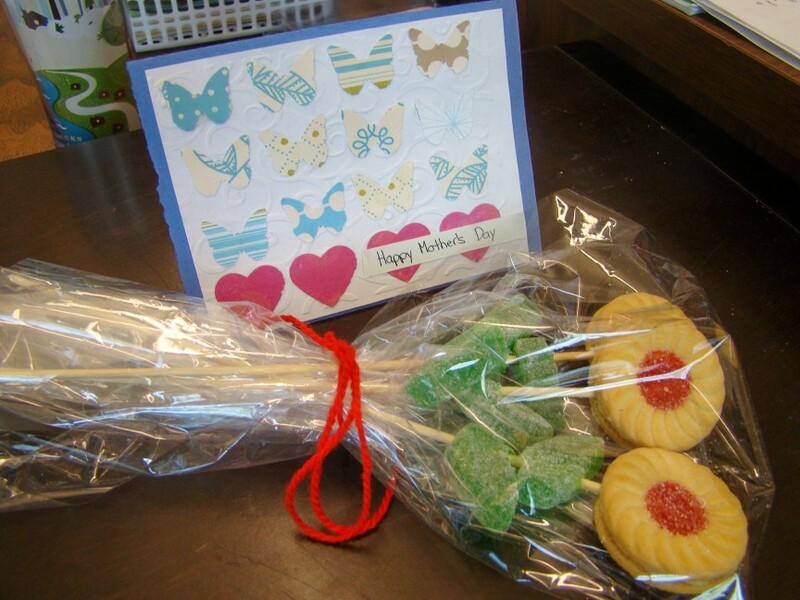 This is the very cute idea I used for the class' Mother's Day gift. It was very simple and fairly easy to put together. The kids loved it! They were especially thrilled because each mom recieved three flowers, and so there was one for mom, one for the child who made it, and one extra to share. A few wanted to taste test first so the cellophane wrapping was more like protection than decoration. Supplies : Box of Peak Frean cookies, Spearmint Jujubes, wooden skewers, cellophane and yarn to wrap it up. Card : Cuttlebug embossing folders, Martha Stewart punches, lots of scrap paper. Wishing all the mom's out there, a very happy Mother's Day. CUTE idea! Ya you would cellophane to protect the cookies from me! lol!